Produced in collaboration between NOAA’s National Ocean Service (NOS) US Integrated Ocean Observing System (IOOS) Program Office and The COMET Program, this video explains how high-frequency radar (known as HF radar) is used to provide detailed information in real-time on coastal ocean surface currents. It describes the important role that HF radar products play in critical coastal operations such as hazardous spill response. Finally, it covers basic capabilities and strengths of HF radar as well as how to access coastal current data. Coastal decision-makers and managers across all levels of government, users of navigation products, as well as coastal environmental resource managers will find this 5 minute video helpful for better understanding and making use of real-time coastal current information obtained from HF radar. Fisheries management, scientific users as well as the members of the general public may also find it useful. For more information on high-frequency radar, visit https://ioos.noaa.gov/project/hf-radar/. Interesting to see how High Frequency Radar is used to map ocean currents. I can hear the signals from several High Frequency Radar sites at night on a shortwave radio receiver. Now I know what I am hearing and understand what it is used for. Basic introduction great info. Would be interesting to have some more science on explaining how two or more sites can make measurements more precise. Great intro for anyone not familiar with High Frequency Radar. Appreciate the important role that HF radar products play in critical coastal operations such as hazardous spill response. Explain how high-frequency (HF) radar works. Describe the difference between HF radar and other more familiar types of radar. Describe the basic capabilities and limitations of HF radar. 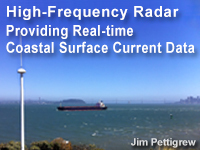 Describe common applications of data derived from HF radar.